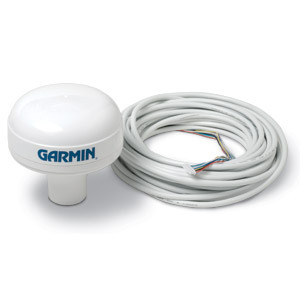 The rugged GPS 17HVS sensor is designed primarily for marine applications. It is water resistant (IPX7), so it can withstand the elements, and it can be pole mounted or flush mounted. This 12-channel receiver continuously tracks satellites and reports your precise position. It is also WAAS-enabled, so it can determine your precise location to within 3 meters — without using an external DGPS beacon receiver. The GPS 17HVS offers excellent EMI/RFI performance, so you can use it near mobile computing devices and wireless communications equipment without worrying about interference. The GPS 17HVS produces RS-232 data in the industry-standard NMEA 0183 format, so it interfaces easily with laptops or chartplotters. It also produces a TTL-level pulse per second (PPS) signal that aligns with the UTC second to within 1 microsecond, as long as it has received valid and accurate position data in the last four seconds.